I have been wanting to learn to make gluten free pasta for several years and have postponed it until recently. This is so simple and delicious that I will never want to eat any other pasta ever again! For all of you visual learners, you can watch my Paleo Pasta Tutorial Below. I saw an add for Capello’s Gluten Free and Grain Free Pasta in the Dec/Jan 2012 Paleo Magazine that looked delicious and made me a little skeptical. Really? A grain free pasta made with almond flour…hmmm…could that really work??? I took a look at the ingredients. Their fettuccini is made from blanched almond flour, cage-free eggs, tapioca flour, xanthan gum and sea salt. The ingredients look pretty simple so I decided to try and make my own. 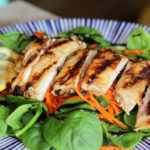 I looked for a recipe online and stumbled upon a wonderful blog called Paleo Cupboard. I made her recipe and even though it was delicious, I wanted to increase the protein and fiber content by adding more almond flour, reducing the starch content and using less salt. Thank you Amy for inspiring me with this Gluten Free Pasta Recipe. Since not all almond flours are made equal, I use Anthony Goods Blanched almond flour and organic tapioca flour. The almond flour is finely ground so that your pasta comes out smooth. They have the best price, top quality and wholesale discounts. 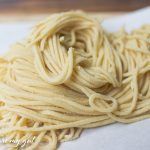 My daughter helped me make this pasta and she had a great time rolling, cutting and getting full of flour. I actually had a hard time getting in on the fun because she was having so much fun making this gluten free pasta. I see this as an opportunity for her to love cooking so I step aside and guide her along. I do not have a pasta maker so this we rolled this pasta by hand. I don’t think I would do this any other way. I love the process of getting my hands dirty in the food. I feel the less equipment I have in the kitchen, the more opportunity I have to put love into the food I am making. 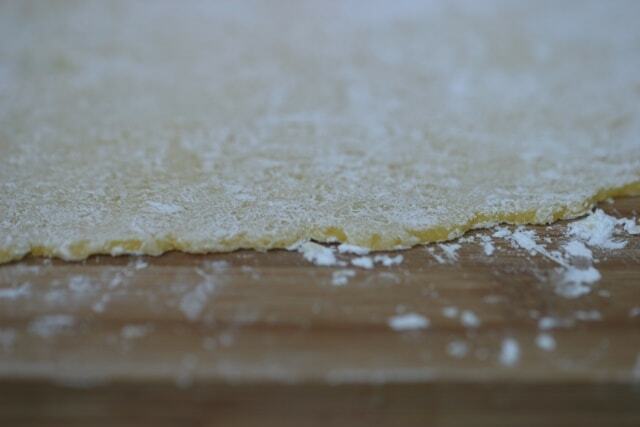 We used a classic wooden rolling pin to roll this pasta out to just under 1/8 inch thickness. We used a pizza cutter to cut out 1/4 inch strips. I trimmed off the edges all around so I all the pasta had a nice straight edge. Well maybe it is not a perfectly straight line, but did anyone complain at the dinner table? Absolutely not! My husband who is NOT 100 % gluten free said that this gluten free pasta recipe is better than any other pasta he has eaten. 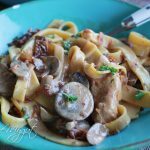 At the dinner table, my kids were so happy with this recipe that it has become our family favorite. 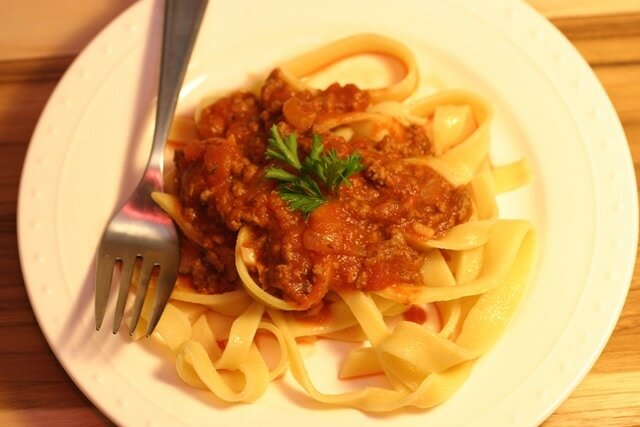 Our new tradition is my husband makes his delicious meat sauce from scratch and my daughter and I make the pasta. Food is bringing us together and building lifelong memories. 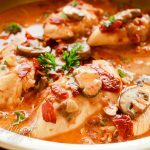 This recipe goes wonderfully with my Best Paleo Meat Sauce or Easy Garlic Cilantro Meatballs and your favorite homemade marinara. Place water and coconut oil in a large pot. Turn heat on med-high heat and bring to a boil. In a large mixing bowl, whisk together almond flour, tapioca flour and salt. Make a well in the center of the flour and add eggs. Whisk eggs with a fork and slowly incorporate flour. 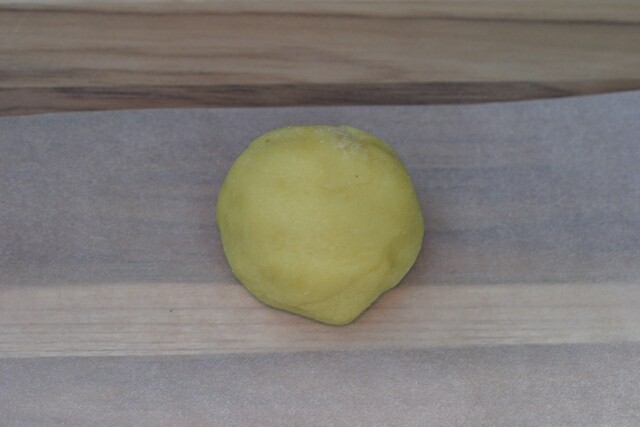 Roll dough into a ball. Sprinkle a large cutting board with a tablespoon of tapioca flour. Knead dough on floured surface for 5 minutes. If dough is too wet, add a bit of tapioca flour. The dough should not stick to your hands and has the texture of play dough. Separate dough into 4 equal sized balls, place 3 balls in a bowl and cover with a dry towel or plastic wrap so it does not dry out. Sprinkle tapioca flour onto your surface and place a ball of dough on top. Sprinkle ball with more tapioca flour. 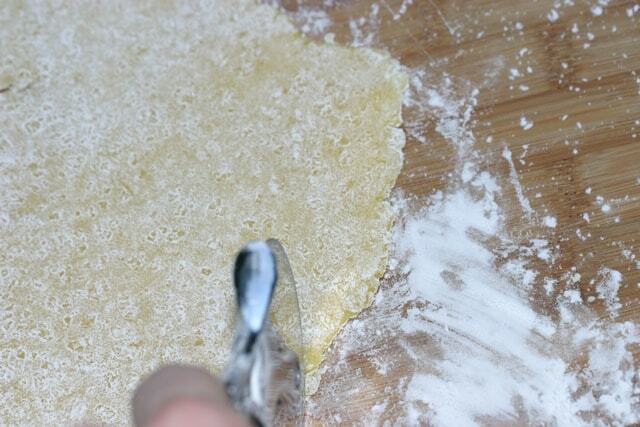 Using a wooden rolling pin, roll your ball of pasta out to the size of a 3 inch disk. Flip the pasta and sprinkle with more tapioca flour. If it sticks to your rolling pin, sprinkle with more tapioca flour. Continue to roll, flour and flip. 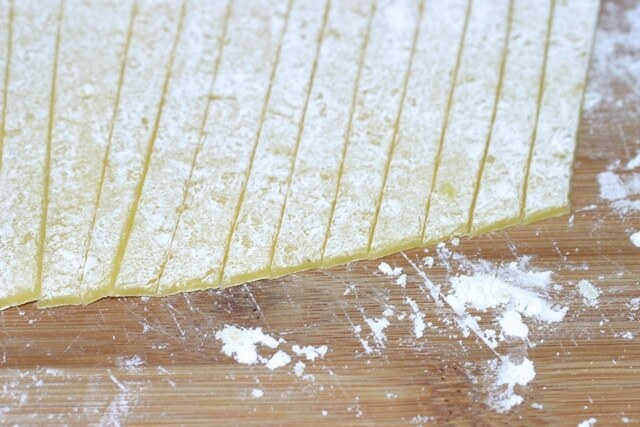 Repeat this step until your pasta is 1/8 inch thick or less. You will now have a large irregular sized square. Using a pizza cutter, cut uneven edges off of pasta and set aside. 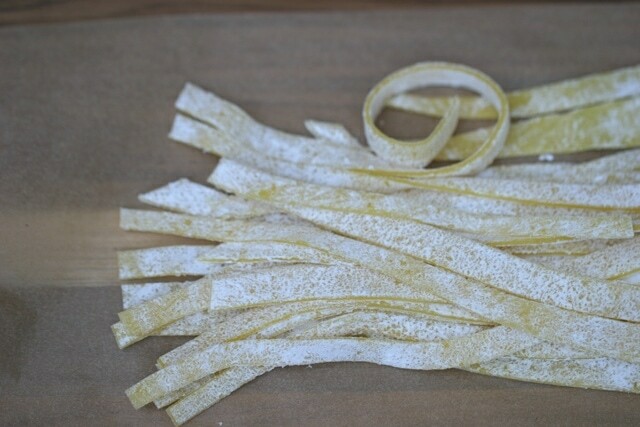 Cut pasta into 1/4 inch strips. Set aside on a large plate. Repeat step 4 with other 3 balls of pasta. Gently pick up a quarter of the pasta and add to pot of boiling water. Cook for 3 minutes. Gently remove pasta with a pasta claw and place into a stainless steel colander. Drizzle with olive oil and gently toss. Repeat step 9 with remaining pasta. 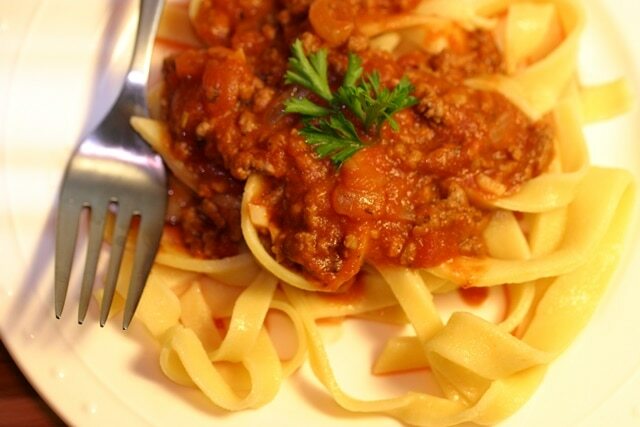 Serve hot with your favorite meat sauce. Bon Appetit! Hi Ester, I assume that when you say “tapioca flour” you mean tapioca starch? It can get confusing as some people call cassava flour tapioca flour and some people call tapioca starch tapioca flour. Which is why I prefer to use the terms cassava flour and tapioca starch to avoid this confusion. Cooking with the wrong one can yield very different results! Yes, I am referring to tapioca starch. Yes, it is all very confusing since the bag I usually buy says tapioca flour. But yes, tapioca flour and tapioca starch are the same. This was absolutely delicious! I didn’t have high hopes to be honest but it tasted exactly like wheat flour pasta! The noodles also held up to a heavy sausage and rapini sauce. It was wonderful to have pasta again, thank you! This looks great! But will the tapioca flour raise blood sugars for diabetics and pre-diabetics? You can look at the nutrition label to adjust it to your needs. It is not a low carb pasta. Tapioca flour does have a high carb number. 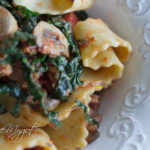 thanks so much ester this was so delicious…my kids loved them better than other pastas!!! i was looking for a gluten free wonton wrap and i am gonna try this recipe for it!!! i am so grateful for your help in my transition to gluten free cooking. do you know if i can substitute xantham gum for psyllium husk? according to dr. peter osborne a true gluten free is without rice and corn and he also said that gums make you more constipated. many blessings to your family and happy new year!!! Can the almond flour be substituted with another flour? I have a nut allergy and go into anaphylaxis. Is it possible to keep this recipe in any way, because I am single and I think it would be tedious to make one serve at a time! I wonder if the balls of dough freeze? Has anyone out there done that? 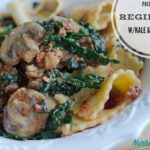 In the meantime, I am going to try this recipe because I haven’t had pasta in over a year while on Paleo and I really miss it! I have been using grated zucchini, which has been good, but pasta now and then will be great. thanks for the recipe. Can you roll this out and cut the day before and then cover and refrigerate to boil the next day? I want to make it on Easter but can’t imagine rolling and cutting it that day too. Thanks Ester and Karyn for your replies. I was finally able to source some inexpensive arrowroot/tapioca flour yesterday, so pasta this weekend!! Thanks again. Wonderful Michele! Let us know how you like it! Hi Ester! Easy crackers or something for soup would be great! I’m also looking for more breakfast ideas as I don’t like eggs which limits me. But any 20 minute dinner recipes would be awesome bc that’s my struggle with being creative in kitchen with paleo recipes. Coming home after work I don’t want to spend 1 hr or more in the kitchen but I also don’t want to have boring dishes. 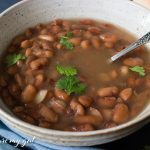 My husband and I have made this several times: so easy and it really is delicious. Whenever anyone asks about our diet I send them the link to this page. Thanks a bunch! Ester, a few months back I tried Capello’s almond flour noodles and was so excited after years of tolerating rice, corn, quinoa flour pastas. Blech. I recently bought a new KitchenAid mixer and bought most of the attachments including the pasta attachments. 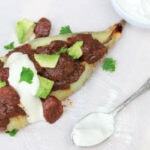 This recipe performs very well with my KitchenAid and about once a week I have been trying a new recipe to the delight of my family. Lobster Mac and Cheese, Mac and Cheese, Roasted veggie marinaras….. I can hardly wait for my ravioli maker to come so I can start experimenting with spinach ricotta, butternut squash….oh so many new possibilities. Thank you for reintroducing this family to pasta after so many years of lousy gluten free pre-made alternatives. We are really enjoying the results. 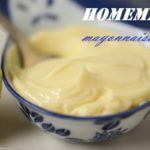 My husband numbers the recipes as his first favorite, second favorite, third favorite…..and so on…..recipes. Thanks for the advice on the thin ravioli, Ester. If the ravioli attachment does not roll the dough thin enough, I will invest in ravioli cutters and roll my own. Looking forward to the experiment. So far, I have done the macaroni and spaghetti noodles in the extruder with good success. Over the weekend I attempted the ravioli Kitchenaid attachment. The pasta roller worked great, but the stuffer was a “no go”. The pasta doesn’t get the same “stretchiness” wo gluten. So I made another batch, rolled it w my machine and cut it by hand. Made butternut squash w sage butter and 3 cheese. My family loved it. Thanks again for the great recipe! I’m excited I’m going to make it tonight ! So looking forward to pasta tonight, and so disappointed in the results. I used my NutriBullet (Vitamix is way too expensive) to grind the flours, and I guess it could not grind fine enough. It was extremely dry, looked nothing like your pictures. Even the addition of water and olive oil, which I use in making regular wheat flour pasta, made any difference. I will try this again when I have the store-bought flours. Sigh. Would these noodles hold up in soup, like chicken noodle? Yes, they taste great in soup!! I did freeze this dough and it was fine when thawed out. I divided it into balls larger than a golf ball but smaller than a base ball, wrapped it in plastic wrap and sealed it in a freezer bag. It was frozen for about 3 months and was fine. Hi Does this recipe yield enough to make 2 sheets for lasagna. I got a great recipe to try and the chef used sheets of semolina. I wanted to say Thank You so very much for your pasta dough recipe. I have been searching for months now for something that would work with my new eating habits of going wheat and sugar free. I cook a lot of italian dishes so I really am excited. I tried this pasta dough a few weeks ago and it was wonderful. I hope you don’t mind, but I did post it on my blog which is about spiritual and health issues. I am trying to find good recipes for my readers as well. However, I did link the blog article back to you. you can find the link at wisdomandinstruction.com thanks again so much. Praise God that some of you have the gift of recreating wheat based recipes into gluten free recipes. My first attempt resulted in noodles that have a slightly slimy mouth feel. It’s better than the last recipe I tried, which used xanthum gum. But the noodles are just a bit slippery. Do you have any suggestions? These noodles are slippery because of the amount of eggs used. Its the best way to bind almond flour. These noodles taste best when they are rolled out very thin and used with a marinara. These are very similar to egg noodles. Can you have grains?? Have you made gluten free noodles with brown rice or sorghum flour??? It may give you the texture you are looking for. I don’t normally leave reviews for recipes, but this was the best tasting pasta I have made in a long time. I made it for my parents, husband and children, and everyone LOVED it. It was so quick and easy to make, that I will be making it at least twice a month. I do have a couple of questions, did you end up ever pre-cutting the pasta and freezing it? Have you tried making ravioli with the pasta? I am going to assume ravioli would turn out fine, since the dough was so easy to work with. Thanks again for the great recipe! I am so glad you LOVED the pasta and that it was a hit with your family! I have made butternut squash raviolis with a sage sauce and it came out wonderful. I just rolled the dough as thin as possible and used a round ravioli stamp. I am craving it now! I have frozen a ball of dough and defrosted it and it came out fine but I have not pre-cut the pasta and defrosted it. Let me know how your raviolis turn out. I’m keto and low carb. Tapioca flour has tons of flour. Any alternatives that you know of? 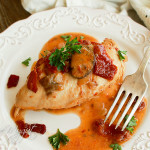 Arrowroot also works well in this recipe. The almond flour and eggs help to release the carbs slowly into your blood sugar. Also, this is a “special” type of recipe, not something we eat on a regular basis. I feel that it is nice to enjoy a special meal out of the ordinary once and a while if it does not cause detrimental side effects. Would I be able to freeze this pasta? I ask because it’s a lot of work for one meal and I want to be able to pull the pasta from the freeze whenever I need it. That is a very good question! I have not personally frozen the dough but others have with similar recipes. I would suggest dividing the dough into 4 balls, then wrap each individually in plastic wrap and place each one in its own freezer proof Zip-lock bag. Then defrost in the fridge when ready to use. I will try to freeze it next week and give you an update! Please let me know your experience with the pasta. Hi! I was wondering if you ever did try freezing the dough? If so, how did it turn out? Any tips? Thanks!